As a young person growing up Cornwall, ON there wasn’t much opportunity to experience live theatre. We went to the movies and I remember the beautiful Capitol Theatre, which “opened in January 1928 as a class A establishment, exhibiting both theatrical performances and motion pictures; it seated 1261. It was one of only 15 theatres in Canada built in the atmospheric style, characterized by the clouds and stars that were projected onto the curved ceilings.” I remember stepping inside and being completely awed. It was regrettably demolished in 1990. But I still like to think of it as a defining moment of magic in my life. The first live professional performance I remember seeing was a Nana Mouskouri concert at Place des Arts in Montréal in 1969. My neighbours, Dr. Denis Deslauriers and his wife Sally kindly took me. Preceded by dinner in a fancy restaurant called Chez Son Père on boulevard St Laurent, it was a really swank affair for a 13 yr old. I played the violin as a kid. My first “professional” gig was playing second fiddle in an amateur production of On a Clear Day You Can See Forever for Glen Productions. I think I was paid about eight bucks, which came in a little brown envelope but nevertheless qualified me as a pro! The next year I sawed away in a production of Annie Get Your Gun. I could have gone on to become a musical theatre whore but when I came to school in Toronto in the early 70s many of the smaller theatres offered pay-what-you-can-matinees on Sundays so I started attending the theatre quite regularly and seeing lots of Canadian stuff rather than going to any Mirvish productions. This is how I first learned about The Theatre Centre. I got to know it more intimately when I took a job as Arts Program Manager at the Laidlaw Foundation a dozen years ago. The Foundation had a long standing funding program that supported the creation of new works for the performing arts. I loved this job because unlike artistic discipline specific jobs at arts councils, I got requests for support for all kinds of performances in music, dance, theatre, etc. so I got to see/hear a variety of work. At that time The Theatre Centre was being run by David Duclos and he was programming a wide array of stuff. I joined the board about three years ago because I had heard that The Theatre Centre had been successful in securing the Carnegie Library on Queen St West as its future home. I thought it would be a really interesting experience to work on a capital project and I had a vested interest as a longtime resident of Parkdale. I felt it was important that this magnificent building be returned to public use and contribute to the cultural ecology of this “new” community now filled with high-rise condos. 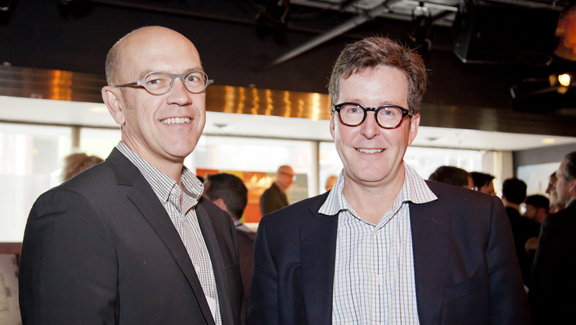 L-R: Denis Lefebvre and Sandy Houston, President and CEO of Metcalf Foundation, at The Theatre Centre Groundbreaking celebration on October 11, 2012. Photo by Maylynn Quan.